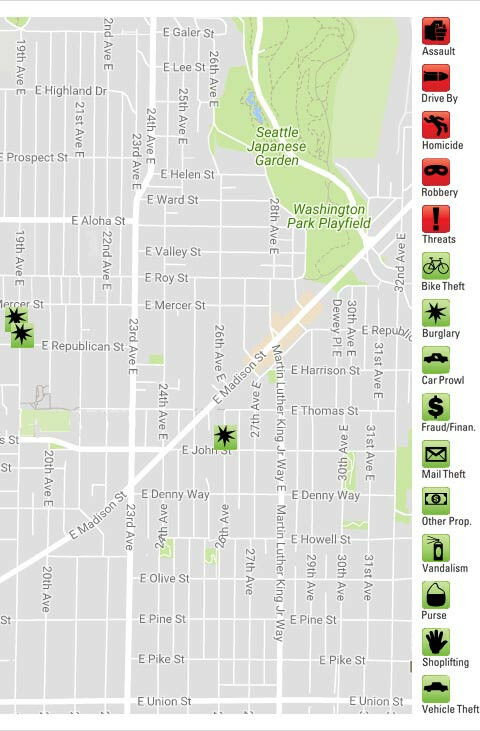 No robberies, no aggravated assaults, and only 3 burglaries were reported to the police from Madison Valley during May. Furthermore, two of the three burglaries were delayed reports of incidents that happened in April. Technically then, the count for April was 9 burglaries and that for May was only one. This is the smallest total, both for burglaries and for the total of all three types of incidents, since I started collecting data on Madison Valley police reports back in 2013. 1. On May 1 police were called to investigate a burglary at business on 19th near Mercer. When they arrived, the owner told them that an alarm had been set off around 2 AM the previous Saturday (April 28th). When he arrived shortly thereafter, he found that the front door to the business locked and no there was no evidence that anyone had been inside. As a result, he decided that it was a false alarm. Subsequently a witness called the business and reported that he had seen a man enter, set off the alarm, and then quickly leave, locking the front door as he did so. Police did not search for fingerprints on May 1 because others had been in and out of the business since the burglary. As they were leaving the police were asked to investigate another burglary that had also happened on April 28 at a nearby apartment building (see next item). 2. Shortly after midnight on April 28, a burglar entered an apartment building on 19th near Mercer by using his cell phone to hack the building’s security system. Once inside, the burglar spent approximately an hour and a half roaming around the building before leaving. The next day, residents discovered that someone had opened several packages in the building’s mail room, but apparently little or nothing was taken because the police report gives the value of the losses due to the burglary as only one dollar. Video footage of the incident suggests that the burglar was the same person who had twice previously burgled that apartment complex. Police did not look for fingerprints because they weren’t informed of the burglary until May 1 and several days had passed since the burglary. 3. Sometime between 10 AM and 10 PM on May 2 a burglar entered an apartment on 26th near John by crawling through an unlocked bedroom window. The burglar apparently took only a laptop computer, and the burglary wasn’t discovered until the next morning when a resident couldn’t find the laptop. Police found evidence that the burglar had entered through the window, but were unable to find fingerprints.